Christmas is the perfect time of year to indulge in a few cocktails with friends and family, and it is also the best excuse to have a festive get together! Le Cordon Bleu London understands the importance of making sure that all of your guests feel included during these gatherings, so we are sharing these fabulous cocktails with a twist, developed by our expert wine and hospitality management lecturer Nitin Radhakrishnan, to ensure that there is something to suit everyone this Christmas. 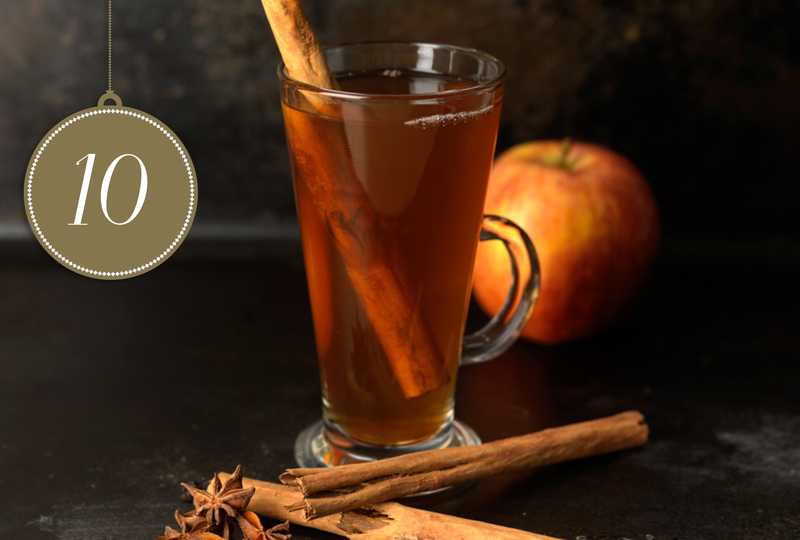 Mulled cider is less common than your classic mulled wine but it is a lovely warming beverage that’s festive spices make for a fantastic Christmas treat. To make it slightly different from the traditional recipe, calvados (an apple brandy) and clove-studded apple quarters have been added to really enhance its fruitiness, and ensure that your guests have a Christmas to remember. Pour the cider and sugar into a pan and warm for 2-3 minutes on a low heat. Add the calvados, the orange juice, the clove-studded apple quarters and all of the spices, and bring to a boil. Turn down the heat and simmer for 10 minutes. Once the spices infuse in the liquor, add the sugar (if needed). Once the desired flavour is achieved, pour into glasses and garnish with dried apple disks, to serve. For those of you that cannot fathom the thought of Christmas without a glass of warm mulled wine then try adding a shot of sloe gin to this classic for an interesting festive twist! Rum punch is usually associated with the sun and fun of the Caribbean, but this beautiful dark rum version with a touch of nutmeg – the most festive of spices, is sure to warm up the spirits of you and your guests this Christmas. In a jug, mix all of the ingredients thoroughly with a mixing spoon and garnish the jug with the triangular piece of pineapple. To serve, add a few ice cubes into a glass. Tilt the glass and pour ½ a teaspoon of grenadine juice into the rim of the glass and rotate for a serpentine design. Pour the rum punch into the glass and top with soda water if necessary. Garnish with chopped pineapple pieces and grate nutmeg twice to finish. Christmas is the perfect time of year to indulge a little and what better way to celebrate the festive season than with a cheeky glass of Champagne. Sugar coated cranberries have been added to our classic champagne cocktail recipe for a delightful seasonal twist. Flavour your sugar cube with two drops of angostura bitters, and place the flavoured sugar cube into the bottom of a Champagne flute. Add the cognac then slightly tilt the glass and add the Champagne. To garnish, place the orange slice on the side of the glass. Dip the cranberries in the cocktail, coat in the caster sugar and shake off the excess. Use the cocktail stick to pierce a hole through the orange slice and thread the stem of the cranberries through the orange so that the cranberries are just skimming the cocktail’s surface. Secure the cranberries with the cocktail stick and serve.